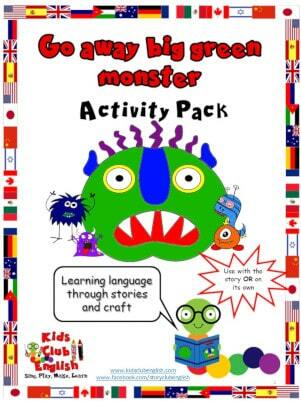 The Go Away Big Green Monster Activity Pack is an excellent resource to support children’s learning in a variety of ways. Use with or without the story to help children learn about body parts and features, practise colour and shape recognition and build on their counting, literacy and vocabulary skills. Activities are specifically designed to allow for differentiation of ability and context and come complete with COMPREHENSIVE ACTIVITY SUGGESTIONS. The suggestions inspire a range of interactive procedures to maximise language acquisition. The entire pack includes 222 pages of resources and information. Please note the Go Away Big Green Monster story is not provided with this resource but is available in major book stores. * Colouring Sheets – A selection of colouring worksheets that can be used in a variety of ways to promote colour recognition, vocabulary and counting skills whilst also helping children to learn and recognise different body parts and features. * Make a Monster Face – This craft activity will allow children to make their very own monster face whilst also playing fun learning games. Children are encouraged to listen and follow instructions and talk about the features of their monster. This activity is also perfect for practising colouring, cutting, sticking and developing fine motor skills. 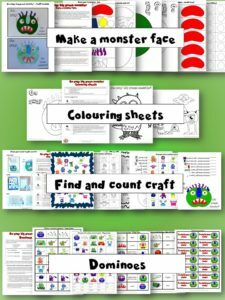 * Find and Count – These sheets provide fun ways for children to practise matching and counting skills whilst again learning about body parts, features, similarities and differences. * Monster Body Jigsaw – Three jigsaw templates are provided depending on the level of difficulty required. Follow the activity suggestions to create more learning fun with a scavenger hunt, jigsaw race or jigsaw craft. 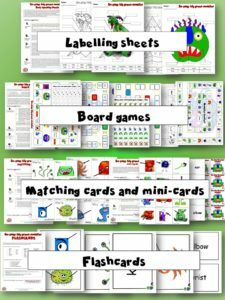 * Body Labelling Sheets – Use these sheets to practise body vocabulary and literacy skills. Try the learning games described in the activity suggestions to encourage children to work in pairs or as part of a group. * Board Games – 6 board games can be played in a variety of ways for lots of learning fun. Children have the opportunity to be creative and practise drawing skills, recognise body parts and colours, develop vocabulary and use descriptive language whilst also working in a group learning to take turns, listen and follow instructions. 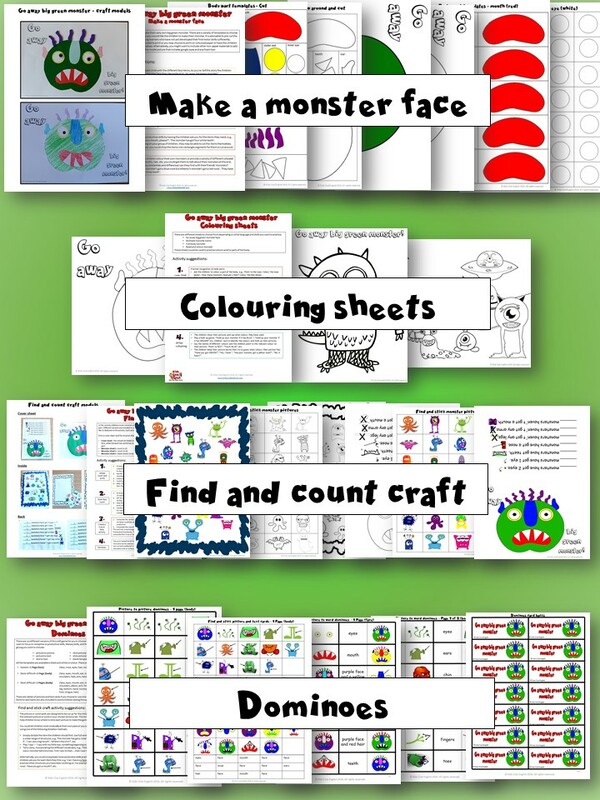 Children can also use templates to create their very own monster game! 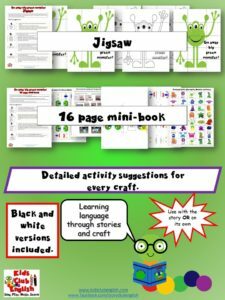 * 16 Page Mini-Book – Using a blank A4 sheet of paper, follow the instructions to make your very own Go Away Big Green Monster Mini Book. Children can practise their folding, cutting and sticking skills then use their finished book to retell the story. * Dominoes – A variety of templates are provided depending on the learning focus and level of difficulty required. Choose to match picture to picture, text to picture or text to text building on matching and literacy skills. Children can also be involved in setting up the domino games practising colouring, cutting and sticking skills. They can also follow the numbers to match up and stick the templates together correctly. Visit the Go Away Big Green Monster Story Resource Page for more Go Away Big Green Monster videos, songs & crafts!